When it comes to herbal remedies, many of us are familiar with the benefits of Echinacea or purple coneflower as an antibiotic, willow bark as a painkiller and aloe as a topical anesthetic and treatment for skin conditions. But that’s common knowledge compared to the insights and treatments that Native American medicine men discovered and used. Native American medicine men developed a wheel very similar to the yin/yang of Asian medicine. The use of herbal remedies and other alternative forms of treatment was the cutting-edge medicine of their day. This was a holistic approach to medical treatment that relied heavily on plants and their unique benefits. What follows is a list of indigenous plants, trees, fruits and flowers unique to North America that have surprising benefits as defined by Native American tribes. If and when times are tough, it might be good to keep some of these ancient cures in mind. They also are good for everyday needs when you consider how effective some of them can be. Recommended: Native Americans Left A Code Of 20 Rules For Mankind To Live By. #11 Is The Most Important! Licorice tea for a sore throat is a good example. It’s also interesting that many of these natural cures are still in use today, including beeswax and bee pollen, chamomile and others. It’s a good demonstration of the benefit of wisdom developed over centuries. It’s hard to know how Native Americans determined which plants might have medicinal properties, although trial and error was probably one approach. It’s also thought that they observed sick animals eating certain plants and determined that those plants must have a certain property worth exploring. Since that time, scientific studies have verified the medicinal value of many plants. In fact, common aspirin is derived from salicin, a chemical in the inner bark of willow trees that were used in ancient times for fever and pain. These medicines were usually administered via teas or pastes that were either ingested or applied externally. Sometimes the plants were eaten as food or added to food or water. On occasion, a salve or poultice was applied to open wounds. I would strongly recommend that you avoid the latter, given the risk of infection from wild sources. I’ve omitted many of the natural remedies. There was a use for mistletoe that I came across, but mistletoe is essentially poisonous and if not used properly the results could be counter-productive, if not deadly. I’ve also found a great deal of redundancy. It seems like everything is good for a cough or diarrhea. Rather than endlessly list plants that cure the same conditions over and over, I’ve tried to isolate this grouping to the most prevalent plants that you may find and recognize. As always, if you are pregnant, check with your doctor and do plenty of research before using any of these. 1. Alfalfa: Relieves digestion and is used to aid blood clotting. Contemporary uses included treatment of arthritis, bladder and kidney conditions and bone strength. Enhances the immune system. 2. Aloe: A cactus-like plant. The thick leaves can be squeezed to extrude a thick sap that can be used to treat burns, insect bites, and wounds. Recommended: What Does Your Native American Zodiac Sign Say About You? 3. Aspen: The inner bark or xylem is used in a tea to treat fever, coughs, and pain. It contains salicin, which also is found in willow trees and is the foundation ingredient for aspirin. 4. Bee pollen: When mixed with food it can boost energy, aid digestion and enhance the immune system. If you’re allergic to bee stings you will most likely be allergic to bee pollen. 5. Beeswax: Used as a salve for burns and insect bites, including bee stings. Intended to only be used externally. 6. Blackberry: The root, bark, and leaves when crushed and infused in a tea are used to treat diarrhea, reduce inflammation and stimulate the metabolism. As a gargle, it treats sore throats, mouth ulcers and inflammation of the gums. 7. Black Raspberry: The roots of this plant are crushed and used as a tea or boiled and chewed to relieve coughs, diarrhea and general intestinal distress. 8. Buckwheat: The seeds are used in soups and as porridge to lower blood pressure, help with blood clotting and relieve diarrhea. 9. Cayenne: The pods are used as a pain reliever when taken with food or drunk in a tea. Also used to treat arthritis and digestive distress. It is sometimes applied to wounds as a powder to increase blood flow and act as an antiseptic and anesthetic to numb the pain. 10. Chamomile: The leaves and flowers are used as a tea to treat intestinal problems and nausea. 11. Chokecherry: Considered by Native American tribes as an all-purpose medicinal treatment, the berries were pitted, dried and crushed into a tea or a poultice to treat a variety of ailments. These include coughs, colds, flu, nausea, inflammation, and diarrhea. As a salve or poultice, it is used to treat burns and wounds. The pit of the chokecherry – much like apple seeds – are poisonous in high concentrations. Be sure to pit the cherries if you’re considering this for any use. 12. Echinacea: Also known as purple coneflower, this is a classic Native American medicine that is used to strengthen the immune system, fight infections and fever. It also is used as an antiseptic and general treatment for colds, coughs, and flu. 13. Eucalyptus: The oil from the leaves and roots is a common treatment when infused with a tea to treat coughs, sore throat, flu, and fever. It’s used to this day as an ingredient in cough drops. 14. Fennel: A plant with a licorice flavor, this is used in a tea or chewed to relieve coughs, sore-throat, aid digestion, offer relief to diarrhea and was a general treatment for colds. It also is used as a poultice for eye relief and headaches. 15. Feverfew: Used to this day as a natural relief for fever and headaches – including severe headaches like migraines – it also can be used for digestive problems, asthma and muscle and joint pains. 16. Feverwort: Another fever remedy that also is used for general pain, itching, and joint stiffness. It can be ingested as a tea or chewed, or crushed to a paste as a salve or poultice. 17. Ginger root: Another super plant in Native American medicine, the root was crushed and consumed with food, as a tea or a salve or poultice. Known to this day for its ability to aid digestive health, it also is anti-inflammatory, aids circulation and can relieve colds, coughs, and flu, in addition to bronchitis and joint pain. 18. Ginseng: This is another contemporary herb that has a history that goes back to cultures for millennia. The roots were used by Native Americans as a food additive, a tea and a poultice to treat fatigue, boost energy, enhance the immune system and help with overall liver and lung function. The leaves and stems also were used, but the root has the most concentration of active ingredients. 19. Goldenrod: Commonly thought of today as a source of allergies and sneezing, it was actually considered another all-in-one medicine by Native Americans. As a tea, in addition to food and a topical salve, it is used to treat conditions from bronchitis and chest congestion to colds, flu, inflammation, sore throats and as an antiseptic for cuts and abrasions. 20. Honeysuckle: The berries, stems, flowers, and leaves are used to topically treat bee stings and skin infections. As a tea, it is used to treat colds, headaches and sore throat. It also has anti-inflammatory properties. 21. Hops: As a tea it is used to treat digestive problems and often mixed with other herbs or plants, such as aloe, to soothe muscles. It also is used to soothe toothaches and sore throat. 22. Licorice: Roots and leaves can be used for coughs, colds, sore throats. The root also can be chewed to relieve toothaches. 23. Mullein: As an infusion of tea or added to a salad or other food, this is a plant that has been used by Native Americans to treat inflammation, coughs and congestion and general lung afflictions. It is quite common and you probably have it growing in your backyard or somewhere close. 24. Passionflower: The leaves and roots are used to make a tea to treat anxiety and muscle pain. A poultice for injuries to the skin such as burns, insect bites and boils also can be made from passion flower. 25. Red clover: It grows everywhere and the flowers, leaves and roots are usually infused in a tea or are used to top food. It is used to manage inflammation, improve circulation and treat respiratory conditions. 26. Rosehip: This is the red to an orange berry that is the fruit of wild roses. It is already known to be a massive source of vitamin C and when eaten whole, crushed into a tea or added to food it is used to treat colds and coughs, intestinal distress, as an antiseptic and to treat inflammation. 27. Rosemary: A member of the pine family and used in food and as a tea to treat muscle pain, improve circulation and as a general cleanser for the metabolism. 28. Sage: A far-reaching shrub across much of North America, it is a natural insect repellent and can be used for the standard list of digestive disorders, colds and sore throat. 29. Spearmint: Used consistently by Native American tribes for treatment of coughs, colds, respiratory distress and as a cure for diarrhea and a stimulant for blood circulation. 30. Valerian: The root as an infusion in a tea relieves muscle aches, pain and is said to have a calming effect. 31. White Pine: Ubiquitous and the needles and the inner bark can be infused in a tea. Used as a standard treatment for respiratory distress and chest congestion. If you’re an expert on Native American cures I’m sure you can add many to this list. There are some excellent books on nature’s cures and the specific medicinal properties that Native American tribes discovered. Natural remedies are worth considering both from a historical and potentially practical point-of-view. Just make sure you identify them properly and check with your physician before using. What would you add to the list? 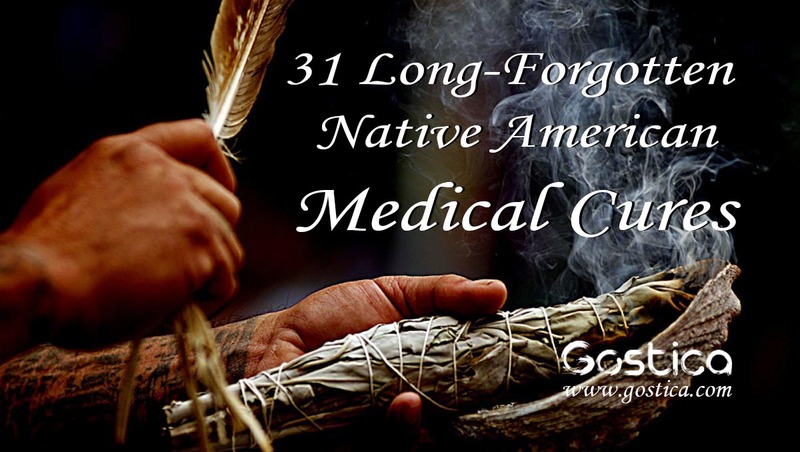 Do you believe Native Americans knew more about medicine than they are given credit? Share your thoughts in the section below.